Ohio Attorney General Mike DeWine offered an update in one of the worst massacres in the state's history Tuesday at a news conference. "There was an obsession with control of the children," DeWine said of the massacre of the entire Pike County family. Authorities announced the arrest of those responsible for the killings, 48-year-old Angela Wagner, and her husband 47-year-old George "Billy" Wagner. "There was an obsession with custody of the children. There was an obsession of control of the children," DeWine continued. The focal point of the case has been the 5-year-old Sophia Wagner who is the daughter of Jake Wagner and Hanna Rhoden. The Wagner's are accused of killing 40-year-old Christopher Rhoden Sr., his 44-year-old brother Kenneth Rhoden, Christopher's 38-year-old ex-wife Dana Manley Rhoden, and all three of their children, 20-year-old Clarence "Frankie" Rhoden, 19-year-old Hanna Rhoden, and 16-year-old Chris Rhoden, Jr. The vicious couple also killed 38-year-old Gary Rhoden and 20-year-old Hannah Gilley was also related to the family. 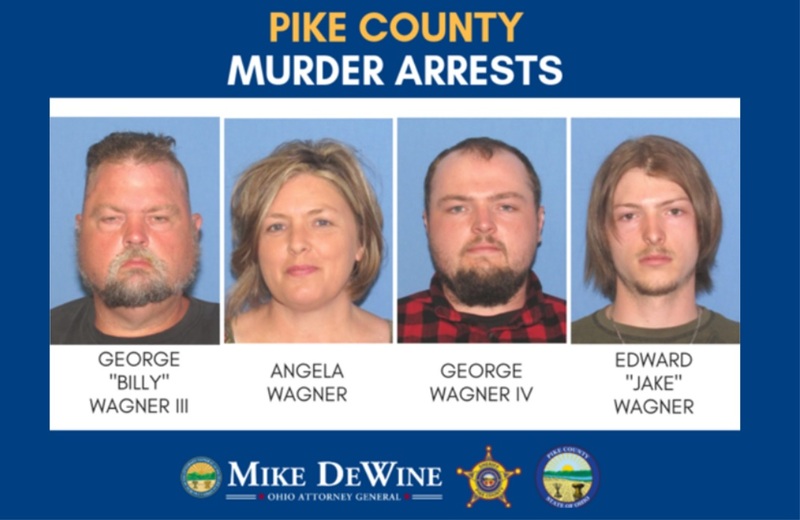 Ohio Attorney General and Governor-elect Mike DeWine announced two more arrests in the case, Fredericka Wagner, Billy Wagner's mother, and Rita Newcomb, Angela Wagner's mother for attempting to obstruct justice by protecting their children. Sheriff Charles Reader said, "George Billy Wagner was arrested in Fayette County, Kentucky this morning after several of my units and some BCI Agents basically followed him where he arrived in Kentucky. We reached out to the Fayette County Kentucky Sheriff’s Office and they assisted in that stop where he was apprehended without incident"
The killings are the state's largest homicide investigation to date with hundreds of tips being called in and dozens of search warrants being issued. The slaying took place in April of 2016 when Angela and George Wagner slaughtered their entire family, eight members in total, even down to the fiance of one of the victims. Once the proper search warrants were obtained, an army of law enforcement in a caravan barreled through a barricade at the Wagner residence. The couple shot each of the victims several times including multiple times in the head. After the initial discovery of the slain family, the Wagners were sought for questioning but were not named as suspects or persons of interest since they lived in Kenai, Alaska. FOX19 NOW reports that the Wagners moved back to the area last summer. "Investigators are interested in receiving information regarding any interactions, conversations, dealings, or transactions that the public may have had with these individuals, which could be personal, business or otherwise. Specifically, information could include, but is not limited to, information regarding vehicles, firearms, and ammunition," FOX19 NOW reported. Investigators say the killers worked hard to cover their tracks making the investigation more difficult. The homicide is already the largest in Ohio history and authorities have conducted tens of thousands of hours of investigative work including 550 interviews. A trial for the accused is set to be held in Pike County Common Pleas Court. Pike County Prosecutor Rob Junk did reveal that it is possible the killers' defense attorneys may ask the judge to move the trial out of the county over publicity concerns.